Goodyear welt construction is considered by many to be the be-all and end-all of shoe construction methods. This is because it’s a method that allows a shoe to be resoled many times over without causing damage to the upper. There is often an elevated price tag for shoes that are made in this way. Until a few weeks ago, if you had told me that I could buy a pair of Goodyear welted shoes for under $100, I’d have laughed in your face. Okay, that’s not entirely true. I’m nicer than that, so I would have just been politely skeptical. 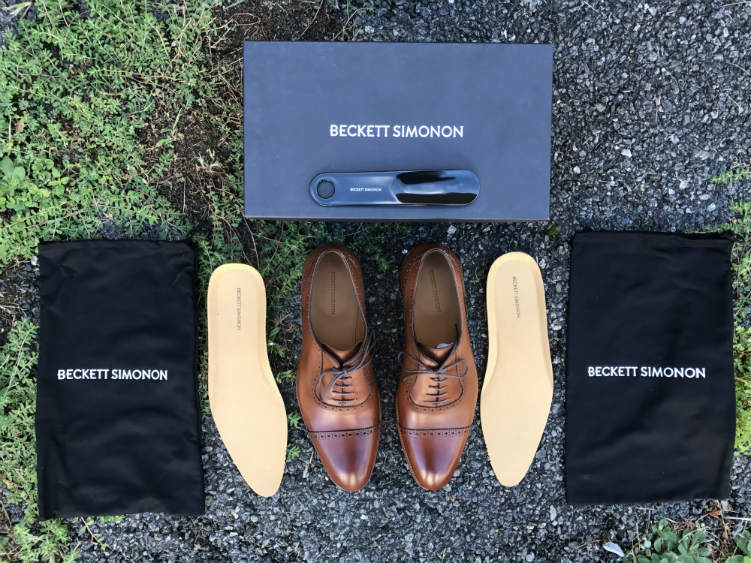 This is precisely how I approached shoes made by Samuel Windsor, a British company that makes a full line of clothing and shoes that’s designed for guys on the tightest of budgets. Given that my son’s day care has essentially increased my rent by 80%, I appreciate a company that keeps a man like that in mind. But what about quality? 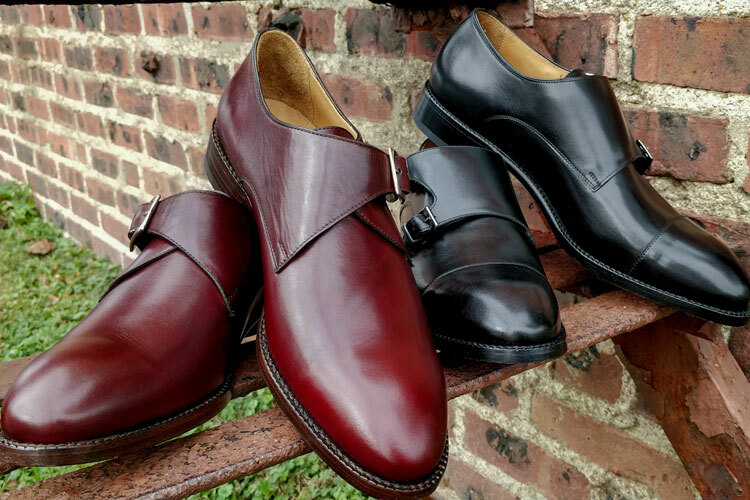 While I love a good deal, I’m also a firm believer in the saying, “You get what you pay for.” Were these guys serious about selling Goodyear welted shoes for as low as $79? Overall, I have to say that Samuel Windsor makes a decent shoe for the money. The quality of the product itself is fine, but the customer service is really what impressed me the most. 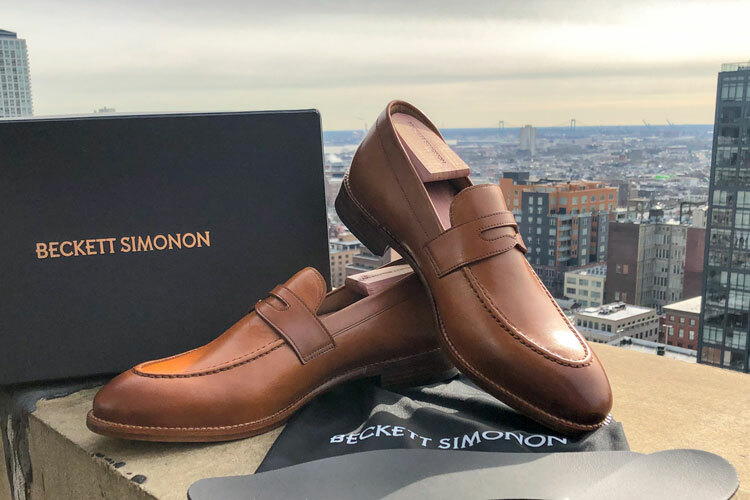 Samuel Windsor offers two collections of shoes: Classic and Prestige, retailing for $79/pair and $99/pair, respectively. Both utilize Goodyear welt construction. The only difference is that the Prestige Collection uses a higher grade Italian leather on the upper and sock liner, and has more padding in the sock. The company’s flashier designs and evening shoes are from this line. Point being: there’s a difference between collections, but not in the construction. To read more about Goodyear welt construction, see our piece on Grant Stone shoes. I got a brown suede semi-brogue from the Classic Collection and Paul got a navy blue suede tassel loafer from the Prestige Collection. For a $79 pair of shoes, I was impressed by what came in the box. The shoes themselves were carefully wrapped in branded paper and each thoroughly stuffed with paper to help them maintain their shape. The shoes also came with a plastic-but-sturdy shoe horn, a pamphlet with company information, and an additional set of laces. There was also a pre-paid return shipping label, which I thought was convenient. It’s worth noting here that these shoes claim to be “handmade.” While I would never call anyone a liar over this, there is no way that this is technically true for a shoe that costs $79. There’s no way it’s true for a shoe that costs $350. There’s no way it’s true for a shoe that costs even $800. 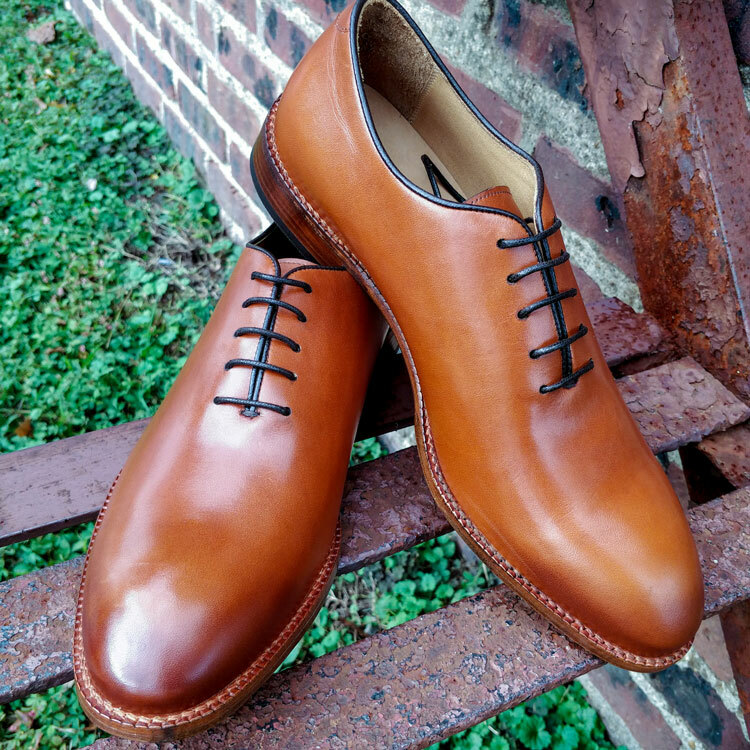 Fully bespoke shoes or ultra high-end shoes like John Lobbs that cost well over $1000 per pair are handmade. I have no doubt that trained human hands did indeed carefully guide these shoes through shoemaking machines over a multi-step process. But handmade? Unless a shoe is fully bespoke, then it’s highly unlikely that such a claim is true. In fairness, Samuel Windsor is not the only company to use this terminology in such a way. 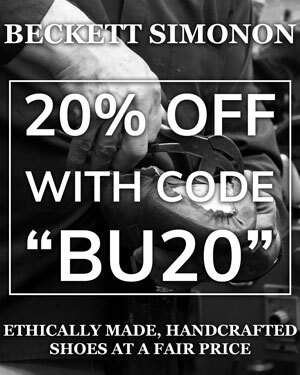 In my early days in the footwear industry, my company sold a gorgeous shoe that was “Benchmade in England.” This was legally true but a bit sneaky, as “benchmade” is synonymous with “handmade” and only about 20% of the work on those shoes was done by hand. The rest was done by machine, albeit by a highly-trained artisan in England. They retailed at $425, and that was in 2006. As stated above, Paul and I both ended up getting suede shoes. I selected a chocolate semi-brogue, and he got a navy suede tassel loafer. While it’s unfortunate that we didn’t have a chance to review a leather option, it gave us a great sense of the company’s customer service (detailed further below). Another positive that came from that is this bit of advice: if you’re going to buy budget shoes, suede is a much more forgiving material than leather. Honestly, I’m a bit jealous of Paul’s shoes, which will look killer with a pair of white trousers in the summertime. 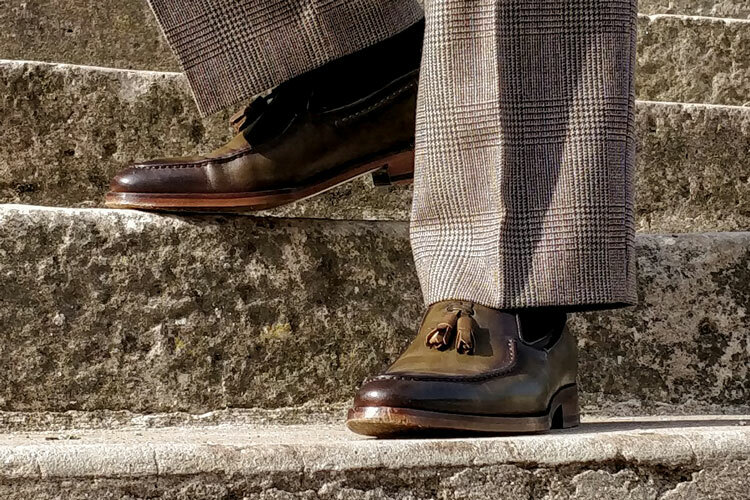 Being a British company, Samuel Windsor sizes its shoes in British sizing, and a good rule of thumb is to go a full size down from your American size when converting. Paul has a wide foot, a 14 wide to be exact. I’m on the other end of the spectrum, rocking a 7D on my 5’4″ frame. He ordered a 13, and I ordered a 6. Paul wasn’t optimistic about the shoes fitting all that well, but he liked the style and has dealt with imperfect shoe fits in the past, so no big deal. They fit so well, in fact, that he was surprised and delighted by it. My shoes were a touch big, especially on the left, which is the smaller of my feet. This was easily remedied by an insole, but as a buyer you should know that our experience is that the shoes run a bit large. If I were willing and able to climb a mountain (and let’s be clear, I’m not), I would sing Samuel Windsor’s praises from the mountain tops with regard to their customer service. My contact was a lovely gentleman named Dan. He was quick to respond to emails and was unfailingly kind throughout the process, which is a great start. What really got me was how he handled an issue we had with the first set of shoes we received. I initially ordered a 6.5, and Paul requested a two-tone leather shoe. The 6.5 was far too big on me, and unfortunately, the leather pair Paul ordered had some quality issues on the upper. It was disappointing. When I reached out to Dan and explained the problem, his response was something that customer service managers should train all of their employees to do: he apologized for the quality issue and sent us replacements immediately, before I even had a chance to drop the originals back at the post office, using the pre-paid return label. This “we’re going to take great care of you, no questions asked” attitude makes me feel confident in buying from this company. Dan handed me off to another representative when he went out on paternity leave, and everyone else I worked with was equally kind and accommodating. I put my brown suede semi-brogues on with a pair of jeans, as it was a Friday and I was feeling a bit casual. The wife and I went for a stroll after an hours-long rainstorm. 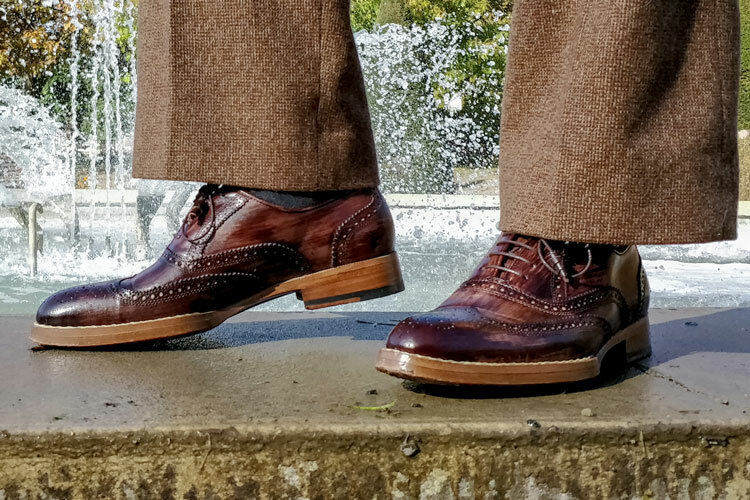 The beauty of a brown suede semi-brogue is that it can be dressed up or down. It gives jeans an air of sophistication they may otherwise lack, and it’s a nice way to take a bit of stuffiness out of a worsted wool suit. Samuel Windsor offers good value. In the world of budget clothing, it’s difficult to find items that are reasonably well-made and also good-looking. That these shoes came with a shoe horn and extra laces was a very pleasant surprise that added some value to an already well-priced item. Are the materials here top notch? No. If you want really high-end leather and suede, you’re going to have to pay more. Are these the most comfortable shoes I’ve ever worn? No, but I’ve paid a lot more for shoes that have wrecked my feet, and I’m sure these will mold to my foot over time anyway. Are there better looking shoes on the market that are constructed this well at this price point? I sure haven’t found a pair. For $79-$99, these are a great value and if you spend that elsewhere, you’ll get a lesser product. Offering stellar customer service and a value-driven product that’s a great fit for a young man who’s just starting to build his wardrobe, I’m happy to recommend Samuel Windsor. Reviewed by Michael Oxman, on May 05, 2017 . "These shoes offer solid all around value. The price point, construction, and excellent customer service come together to make a product that looks good and costs little. Happy to recommend!" We appreciate you commenting. The review did state that the shoes seemed to run a tad large. While one shoe did seem larger than the other, I know that my left foot is a bit smaller than my right (as is the case with most people) and thus can’t fault Samuel Windsor for that. Given the price point and excellent level of customer service we received, we still feel that there’s value in the brand for a budget shopper. I’d have to agree with Michael. I’ve been wearing my blue suede tassel loafers, and think they are more than acceptable and a great summer shoe re design. For my personal tastes and high level of shoes currently in the collection, I’d personally avoid their leather offerings. But for me the suede ones hit the mark on the balance between quality and price. Poorly made. bad sizing. Stick with made in the usa. Thanks for commenting. As I mentioned in another comment, our experience with their customer service department coupled with their price point allows us to stand behind our assessment of the shoes. It is true that there are better shoes on the market for sure, but for a man on a budget, we think that these do the trick, especially in suede. I’m not surprised you had to send a pair back because of bad leather. not a fan of these shoes. Thanks for reading. The leather issue was indeed unfortunate, but again the customer service level we received was top notch. Furthermore, I’ve seen this kind of thing happen with shoes that have higher price points too. It happens! You get what you pay for, and with these you get fantastic value…. There are differing standards of “hand made”, just like other industries / country certifications. For example what is classed as a “Swiss Made” watch can be confusing. I bought some shoes from Samuel Windsor recently. They say if you are a USA size 10 that you should purchase a 9.5. I followed their advice and the shoes are way too big. I saw reviews from others stating that the sizing of their shoes are inconsistent. They wouldn’t accept my return so I guess I have to wear clown shoes or throw the shoes away. I’d avoid buying from this company. Thanks for the feedback. This is not good to hear. I’ve personally had two pairs from them with no issues at a UK size 13. Are other in the community experiencing other issues? If so I’ll re-write this post, and offer up some other options…. I bought a pair of penny loafers. The left is definitely smaller than the right and I never had this problem with any other company. For what I paid and for the casual wear, not for long walks, they are fine but the price and quality are what you would expect. The leather is not the highest quality but, again, for a moderate price they will do. Thanks for your comment. Glad to hear that you’re overall happy with Samuel Windsor. Indeed, they’re a solid choice when on a tight budget. Did you change the pair where the left was larger than the right? One issue I have is that the sizing is little inconsistent. My Thursday or Allen Edmond stuff is size 12.5 U.S. and I ordered the 12 UK and it really feels more like a 13 U.S. when I wear them. My Thursday and Allen Edmond stuff gets a nice hug 12.5 U.S. on my feet compared to SW 12 UK, as those feel there is some slippage in the shoes. All-in-all I am happy with my purchase and look to eventually order some other products they make in shoes for budget stuff to add into my shoe collection. We’ve noticed that sizing is something that’s often quite inconsistent. Either way, we’re delighted to hear that you’re happy with your shoes. I am interested to hear how the Suede has been holding up since you’ve ordered your shoes and have been wearing them. Also interested also to see how the leather sole is wearing. I would love to tell you but the reviewer (and owner) of the shoes no longer writes regularly for Bespoke Unit. However, I’m confident that they’ve been wearing well! I have nine pairs of SW shoes and boots. I think they are manufactured in Portugal to reduce costs. Definitely agree that sizing can be inconsistent – for example, my size 9 1/2 (UK) Oxford boots are a tighter fit than my size 9 brogue boots – so be sure to ask for a returns label when ordering in case you need to exchange. A couple of points regarding the rubber-soled shoes – they can be very slippery on wet, tiled floors and the rubber heels wear down quite quickly. For the price though, the quality of these shoes is excellent and mine have attracted many compliments. Thanks for sharing your experience of Samuel Windsor here! It’ll undoubtedly be helpful for other people in the future!